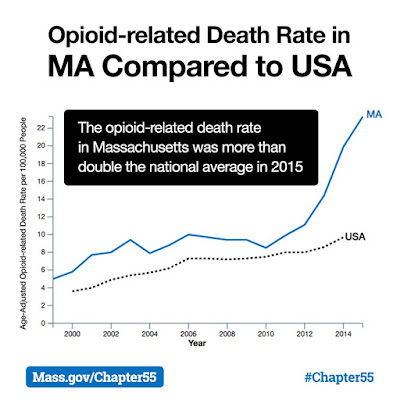 Opioid-related deaths occurred in two-thirds of the cities and towns in Massachusetts - more than double the national average. The legislature and the Governor have worked collaboratively to respond and offer support to families, public health and public safety officials and those who are addicted. The Chapter 55 report, which stems from legislation adopted in 2014, provides insights and new visual representation of our situation and what we are doing about it. Please visit the Chapter 55 site and become informed.